The certified letter came from his alma mater in mid-July, just a few days before his 34th birthday. But Penn State quarterback coach Ricky Rahne never got a chance to open it. 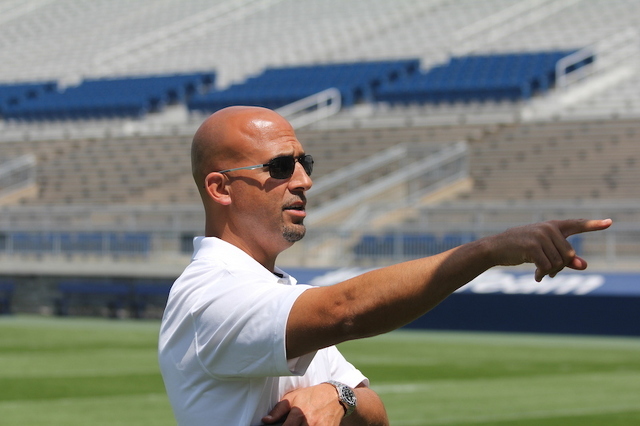 As a member of James Franklin’s football staff, Rahne was spending long days in Penn State’s Lasch Building, preparing for summer drills that were a few weeks away. Rahne’s wife, Jennifer, a Pittsburgh native he met at Cornell when the two lived on the same dorm floor as undergraduates, got to the letter first. And made a special day even more so. “It would have taken days if we had waited for me to open it,” Rahne chuckled last week. So Jennifer did the honors. Honors indeed. Inside the envelope was a letter from Cornell, informing the former Big Red record-setting quarterback that he had been selected for induction into the Cornell Athletic Hall of Fame. From Jennifer’s point of view, the announcement was a work of art. Literally. When Rahne walked in the front door after a long day of meetings and video review, she was waiting. “Hey,” she said, “I want to show you something,” and led him through the house, where her husband expected to see some of the recent handiwork of their young sons, Ryder and Jake. Something else, actually -- in a good way. The letter and the induction into the hall provided a final exclamation point on a career that saw him start three consecutive seasons for the Big Red (1998-2000) after heading 1,661 miles east from Bear Creek High School in suburban Denver to Ithaca, N.Y.
Rahne's official Hall of Fame biography on CornellBigRed.com reveals that his selection was an easy choice. Rahne had a flair for the dramatic. In 2000, Cornell won three games by a single point, another by two points and its fifth win of the season was a veritable blow-out, a 35-31 victory at Columbia. In all, of Rahne’s 14 victories as a starting college quarterback, 10 were by five points or less. Broken down, that’s winning margins of 1, 1, 1, 1, 2, 2, 3, 4, 4, and 5 points. And, obviously, he had presence of mind as well as in the pocket. Even today, Rahne has the calm and measured demeanor of a seasoned quarterback, down by a touchdown in the fourth-quarter – which no doubt helps as a parent of active young sons. Still, among his best memories of his days as a Ivy League QB are those tight wins. 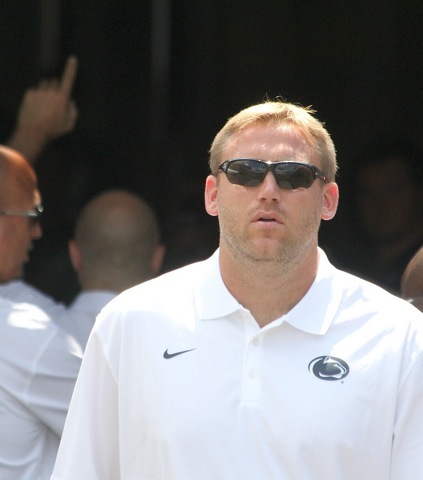 As much as anything, Rahne relishes his Cornell days for the relationships – what a surprise for a guy who’s worked with Franklin as an assistant at Kansas State (QB, TE and RB coach), Vanderbilt (as quarterback coach); and now Penn State. Rahne was also tight with Pete Mangurian, Cornell’s head coach during his first three years there. Mangurian – now the head coach at Columbia – left the Big Red to coach in the NFL. Among Mangurian’s stops in pro football was a four-year stint with the New England Patriots. He coached the Patriots’ tight ends while another guy who knows a thing or two about Penn State quarterbacks – former PSU head coach Bill O’Brien – coached the Pats’ wide receivers. Rahne tried the corporate world when he graduated, but playing in a couple of flag football and softball leagues didn’t quell his desire for football. So, he took a $50,000 pay cut and went to work as a defensive line coach at Holy Cross. He returned to Cornell to coach for a year, then headed west to Kansas State. Rahne’s success and experience as a top-notch quarterback himself helps on the Nittany Lions’ practice field. That’s whether he’s guiding savvy sophomore Christian Hackenberg – the Big Ten Freshman of the Year last season – or highly-touted freshman Michael O’Connor, who the Lions are furiously trying to get some big-time summer scrimmage experience against Penn State’s first defense to hasten his maturation process and solidify him as Hackenberg’s backup. “I think that I played quarterback makes it a little bit easier,” Rahne said. “Guys who haven’t played the position and coach it may have some unrealistic expectations about footwork or what you can see on the play. They may have you looking at two different spots. It’s just unrealistic. Rahne – 252 of 479, 2,944 yards, 52.6%, 13 interceptions, 18 TD passes. Hackenberg – 231 of 392, 2,955 yards, 58.9%, 10 interceptions, 20 TD passes. Rahne is one of 11 former Cornell athletes being inducted into the school’s Hall of Fame. Ceremonies will be held on Friday night, Nov. 7. Rahne won’t be able to attend. He’ll be in Bloomington, Ind., for Penn State’s game the next day against the Hoosiers. As usual, his wife Jennifer will handle it.